Tried to get existing project into mobile viewer using both iCloud & iTunes (see screen captures "For Formz"). Both did not show up as a choice in app. I uploaded a folder containing fmz project & textures... user components were in project (they were embedded). Did I do something wrong? 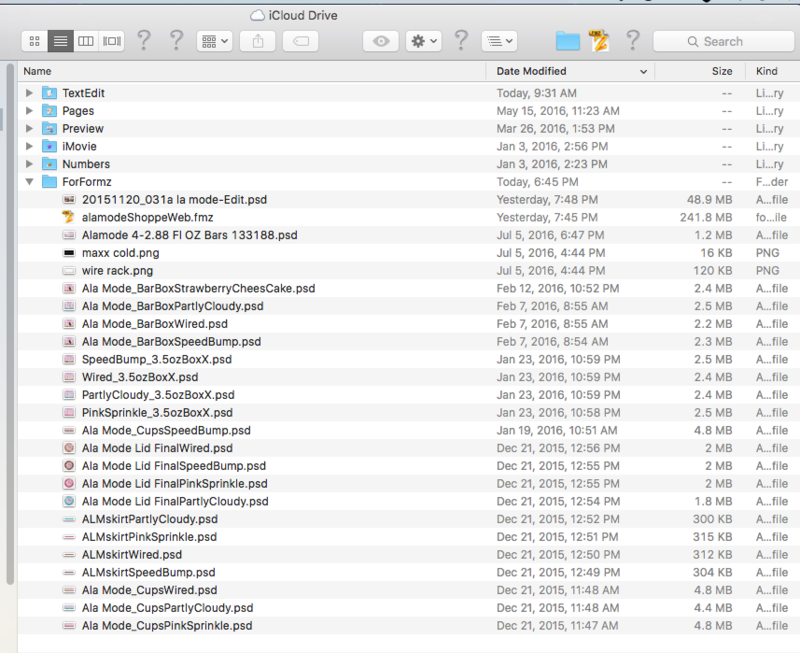 I also noticed on iCloud drive file extension was not shown. Are there any size restrictions? Folder finally showed up in iCloud Drive but not sure where to view in folder on app. I originaly dragged folder unto iCloud on computer finder (did not work) then was successful putting onto iCloud through Safari. Project did not open but reverted back to home screen on iPhone? You are likely exceeding the memory capacity of the device with the 240 GB model file. Unfortunately memory on iOS devices is not virtually unlimited like is with OS X. When an app uses too much memory, iOS just terminates the app without warning (thank you very little). The memory on the device that affects the ability to load the model is the RAM as opposed to the storage (flash) on the device (this distinction can be confusing and RAM is often not featured in device specs). Current iOS devices that we support have 1, 2, or 4 GB of RAM. iOS devices do not have dedicated graphics memory so the RAM must hold the video display, the operating system, the Viewer app itself in addition to the loaded model and the OpenGL ES resources needed to display the model. The 12.9" iPad Pro is the only device with 4 GB of RAM (but it also has the largest display so it needs the extra RAM). What device are you using? We invested a lot of effort in tuning memory efficiency in the viewer app and we continue to look for ways to conserve RAM and graphics resources to allow of the display of larger models. You can also reduce your file size by purging unused materials, unneeded layers, ghosted objects, reducing texture sizes and reducing the display resolution of smooth objects. If you could send your model to support, we might be able to identify why it is exceeding the device capacity. Should there be an option for "Save for Mobile" which would provide options eliminate invisible layers, regenerate smooth objects low polys, etc. --- whatever optimizations are appropriate? It was just a test... I will start small & see limitations of iOS device. Background image (does mobile support this) was 48.9 MB psd file. Not sure why folder did not show up in app? We do plan on adding a Save As option for the desktop app that will save a file optimized for the viewer. This option will reduce the files size buy removing data that the viewer can not use as well as unreferenced data like materials and components. We will likely include some options for reducing texture sizes and possibly mesh density (this is still being investigated). When a project is modified on the mobile device, we change the name (myFile.fmz becomes myFile.viewer.fmz) to avoid accidentally overwriting the original file (as the viewer naturally skips data that it can not accommodate like ACIS etc). The new Save As option will follow this convention as well. Unfortunately its nearly impossible to predict the memory usage for a project as there are so many variables involved. Each device has different requirements due to variants in iOS versions, memory overhead, memory fragmentation and screen size. Ironically an iPhone SE can open larger models than an 9.7" iPad pro. They both have 2GB of memory but the iPhone SE screen size (1136 x 640) uses significantly less memory for the display and in the graphic resources the viewer requires (but the processor in the iPad pro is much faster!) Hopefully future device will have more RAM! Any idea how to trash a formZ Mobile Viewer Folder (323.3MB) ? There is no delete or rt click prompt. When drag to trash it just copies it. I am doing from computer. Am I right assuming folders with project, texture maps are to be added Mobile Viewer Documents in iTunes? - Select the Apps section. - Navigate to the formZ mobile viewer at the bottom of the apps section. - Select the folder or file to be removed. - Press the Delete key. - iTunes wil ask you to confirm. The viewer will use the cached texture embedded in the project so the external files should not be necessary. Thanks... guess I should have hit delete. That is good to know about textures. Is there any fmz documentation, manual which had this outlined? Where is an added folder suppose to show up on iPhone from iTunes or is fmz project file just supposed to be added without folder. iCloud worked but file added to app did not. Is one way of adding better then other? Does I cloud version really on internet connection or is it stored on phone once added? It's cool... & looking forward for future features. Guess it seems to be having a problem viewing some multiple texture maps? Project is saved with textures checked. Decals are not expected to be seen. My 119MB file to big to attach I will email to support. I uploaded to your ftp "alamodePriceSheetMob.fmz" is this too big to view on iPhone 6Plus as some objects are wire frame some are textured? Can I delete the sample files to increase space for my project? I have 24gb available on the iPad. If you unlock the layers in the .fmz file, re-save, and then open the file in the mobile viewer, does that help?